Learning about solar in the classroom is more than just a way to learn about ecology, or physics. In Virginia and other places, it’s now about the intersection of several powerful forces, and the future of our energy use. This past fall, the Washington Post reported on a 2017 wind energy competition in which a team at Lanier Middle School in Fairfax won second place in a 2017 KidWind science challenge by building a wind turbine model. Robert D’Souza, the instructor who worked with students on the turbine project, explain how solar-based projects prepare students for a future in which renewables will be central to energy plans in communities. Sure, it’s nice for students to know how turbine works from a physics perspective, and this might be a conventional part of curriculum — but look closer, and you’ll see that many of these types of learning are seen as early “jobs programs preparation” as well — we reported last week on how solar jobs are the fastest-growing profession in America, and that’s leading both public and private sector planners to focus on the power of wind, solar and other renewables. Students at Lanier relied on resources from the Virginia Center for Wind Energy at James Madison University in Harrisonburg, Virginia, which has assisted with ten turbine projects across the state. While students are building these physical infrastructure models, they’re also learning something else — how important naturally derived energy will be in their worlds as they grow. In Virginia, many experts are looking at how political will has that built for renewables and the solar industry in particular. The outgoing governor Terry McAuliffe has laid a lot of the groundwork for his successors to get even more proactive on solar — and reports now show that some new Virginia House of Delegates members are now choosing to reject certain kinds of lobbying that promote the “old ways of oil” including money from major utility companies. This is a big deal, and the ramifications of this news are going to ripple around the state in a big way! Ask Sun Day Solar about how you can benefit from green energy for your small business or property. 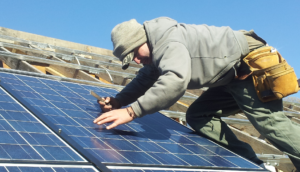 We help a wide range of clients in Charlottesville and the surrounding area to figure out what works for them, and assist early adopters in this massive move towards cleaner and inevitably more affordable energy sources.